Mint - Friend or Foe? Mint has gained a poor reputation amongst many gardeners. The mere mention of it will bring forth warnings about how invasive and weed-like it can be, choking out all other plants and herbs in the vicinity. Yet I find it hard to hate this delicious herb and, by following a few sensible precautions, it can easily be grown well with a range of uses in the kitchen. Mint has long been known to have many health benefits as well as adding flavor to cooking. Mint tea is great for settling the stomach and is also said to increase stamina and resistance to colds and coughs. Its anti-bacterial and anti-fungal properties are perhaps one of the reasons it is so effective in toothpastes and mouth washes. Mint comes in many different varieties including apple mint, spearmint, pineapple mint, orange mint and even ginger mint, not to mention the variegated varieties used for their ornamental value. Sourcing these different types can be hard as few seeds suppliers stock more than a single variety. 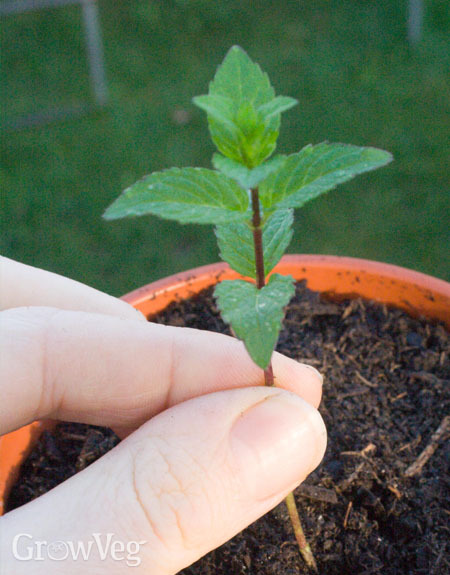 However, mint is so easy to grow from cuttings that I would never consider growing it from seed unless I wanted a particularly unique tasting type (just what do you do with the rest of the 1000 mint seeds typically in a packet?) Far better, in my opinion, is to sample mint that other gardeners are growing and choose the one that suits your palate before taking a cutting. The first consideration when growing mint is finding a place where it can’t spread. For me this means a large terracotta pot in easy reach of the kitchen. If you want to add it to an existing herb bed then the best way is to sink a deep bucket or tub without holes into the soil and plant into that as otherwise mint will quickly choke out the other plants. Apart from that, mint is not a fussy plant and will even grow under trees or in shade. It likes to be kept moist, so will need watering in hot weather, and any flower heads should be quickly removed to keep leaf growth good. The only disease it occasionally suffers from is mint rust which is a fungus causing orange or black spots on the leaves and requires the removal of affected plants and root system as soon as it is spotted. The best way to propagate mint is from cuttings or root sections from healthy plants. Cuttings can be taken in early spring and, after removing the bottom leaves, are simply pushed into moist-but-not-damp soil. Within a few weeks the cuttings will have rooted and can be left to grow, quickly filling the container by summer time. Mint spreads through underground root systems and sections of these roots can be planted in autumn as an alternative to taking cuttings – useful for overwintering because mint dies back at the first frost. When cold weather approaches, plants can be lifted and brought indoors in their own pots to give fresh leaves through the first part of winter. So, mint is simple to grow and can be controlled without too much effort. Yet there is so much more to this plant than growing it. Mint is one of the first plants I show children in my garden – it looks ordinary but rub a leaf between your fingers and the smell is wonderful. I regularly add it, finely chopped, to cooking that needs some bright tastes. For example, slowly cooking zucchini and then adding mint and lemon juice gives the perfect combination of sharpness and soft vegetable. Mixing mint in with white wine vinegar and oil makes a great dressing for salads, or try combining it with cooked beans and sweet corn kernels as a side dish. Mint also works well with a number of sweet dishes, especially fruit salads and chocolate desserts. Then, as an after-dinner treat try infusing fresh mint leaves in hot water for 5 minutes. Delicious! "Yumm.. We all love mint. Especially the Chocolate Mint variety. I add it to most green salads. I had it growing in an aquaponics bed but it wanted to take over. Recenty it escaped to into a very sad lawned area. We have decided to let it have its way and now simply mow it. Can you imagine the wonderful smell every time we mow? It makes the dreaded chore into a treat for the entire family"
"I to have ment in my garden but it has taken over." "I'm gradually moving spearmint, peppermint and catnip to the far side of my garden, along a mowed walking path often browsed by deer that wander in from the woods. They don't like these and other aromatic herbs, which make valuable "deer-scaping" plants. " "We keep bees and have read several articles that suggest that mint may be a plant that the bees can use to keep their hives healthy. So we plan to plant sub-surface pots of mint around our bee hives." "Sharon, how very interesting - I had no idea there was a link. Do let us know how this goes and whether you see any benefit." "I have a white fungus on my mint, any ideas???" "Zoe, it is probably powdery mildew. In the Pacific Northwest region it is often a problem on mint. Prune off badly affected stems, because the leaves won't recover. However, a spray of one part milk (any kind) to 6 parts water applied weekly will keep the mildew from getting worse as the plant makes new growth. " "I have powdery mildww on my mint. as i eat it in various forms, what can I spray it with that wont poison me." "Jolly, the best remedy is the one Barbara Pleasant suggests above - I certainly wouldn't recommend spraying it with any fungicides." "I must be the only person in the world who can kill mint!! Mine looked splendid in the summer and was delicious in tea and salads, but now is brown and all the leaves have shrivelled and died. Do I need to chop it back? Have I killed it? Will it grow back?!! " "I notice that my pumpkin flower (sprout) was wilt because it fail to pollinate, why because the mint which surround it keep the insects away whose important in cultivated. So I was get rid of."